The room is beach-themed with peach-colored walls and blue and tan throw pillows — “Life is better at the beach,” one says — and it’s waiting for her. For 13 years, Hannah Viens has shared a room with her three sisters in the finished basement of her family’s Kansas City, Kan., home. Her older sisters are night owls — Hannah likes to rise early and read her Bible. And when her chemotherapy treatments made her weak or sick, the stairs were challenging. Today — Christmas Eve — that ends. But Hannah doesn’t know it yet. Moving to the bigger home that her parents, Jim and Kim Viens, bought earlier this year wasn’t supposed to happen until later in the winter, when family friend and Master’s Community Church pastor Adam Anderson expected to finish the remodeling he had agreed to do for the family. But for the past month, the Elves of Christmas Present have volunteered countless hours finishing the house for the Viens family to enjoy. On this Christmas Eve, while Hannah, her parents and her siblings Elizabeth, 19, Faith, 17, Rebecca, 16, Isaiah, 12, and Matthias, 3, enjoy a limo ride to the Country Club Plaza and a dinner at the Capitol Grille, a team of elves arrives at their old house to move furniture and belongings to the newly finished one. Only father Jim, a systems engineer at Cerner Corp., knows what is in store. It’s been tough to keep this a secret, particularly from his wife, who has wanted to visit the home to make decorating decisions, and his fourth-born daughter, who will need more space and assistance as she continues treatment for medulloblastoma, a type of brain cancer. Just in time for Christmas, Hannah will have a bedroom on the main level, a bathroom right across the hall and a window overlooking the backyard — a place for a girl who loves arts and crafts, crocheting and coloring books to call her own. They discovered the cancer because of the trampoline. At age 10, Hannah began to suffer bouts of nausea and the occasional headache. But it wasn’t until she grew violently ill after just a few jumps on the family trampoline that it became clear something was seriously wrong. At the hospital, doctors had to hold her up to walk to the bathroom. 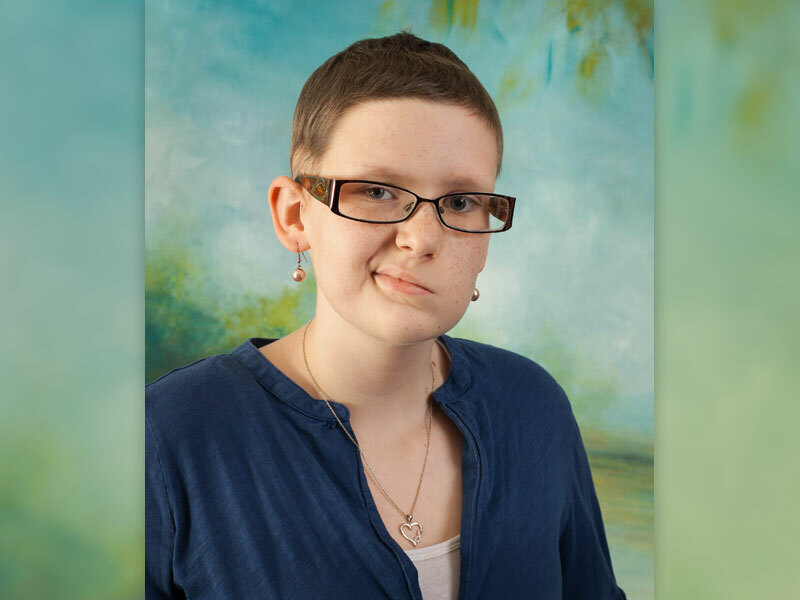 An emergency scan revealed a tumor at the base of her brain — medulloblastoma. Surgeons removed the tumor, and Hannah spent the next year and a half receiving radiation and chemotherapy treatments. Jim Viens remembers the day he was outside in the yard shortly after Hannah’s first surgery. The Viens had left a baby monitor beside her bed in case she needed to call for help as she recovered. Instead they heard Hannah quietly praying for all of the other kids she had met at the hospital. “It was such an insight into her,” Jim Viens said. After treatment, follow-up scans came back clean, but in May, Hannah had a recurrence and doctors don’t know if treatment will again be successful. In many ways, Jim Viens says, his daughter understands that her attitude can influence her outcome. And that she must trust that God has a plan for her. And so Hannah continues with her routine as best as she can. She plays with the Rainbow Loom she got for Christmas last year. She reads her Bible and chats with her family at dinner time. She enjoys the good times, like when the Make-a-Wish Foundation sent her family to Hawaii last year so she could attend surfing star Bethany Hamilton’s camp. It was a Children’s Mercy Hospital social worker who alerted Chief Elf to the Viens family. Chief Elf, who never reveals his true name, leads the Elves of Christmas Present network of volunteers who quietly give time and money each year to grant Christmas wishes to Kansas City area families. Anderson says he received a call from Chief Elf shortly after Thanksgiving. He wanted to get the family into their home by Christmas. “I thought he was out of his mind,” Anderson laughed. Instead, Anderson found himself with teams of plumbers, carpenters, electricians and construction workers who worked on the home through last week to make it ready by Christmas Eve. Among them: a lighting crew that decked the whole house out in colorful bulbs. Those lights were the first thing the Viens family saw when they pulled up to their new home after a special day. A few minutes before, Chief Elf had said, “Time to roll.” The elves scattered as quickly as they had arrived. The family arrived next. The kids saw the decked-out tree with dozens of presents in the corner. The large kitchen. Kim Viens wept with joy. Hannah looked around thoughtfully, clasped her hands and went straight to her room. She had a new full-size bed with lots of pillows to remind her of Hawaii. She sprawled across the bed and took off her purse and her hat. She smiled. A bedroom of her own, a bathroom right across the hall, a window overlooking the backyard — a place for a girl to call her own.